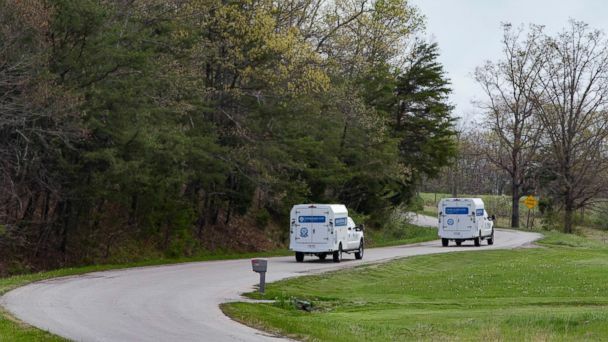 At least eight family members are dead in what appeared to be "execution-style killings" today across four different locations in Pike County, Ohio, according to officials. All eight victims -- believed to be seven adults and one 16-year-old -- appeared to have been "shot in the head." Seven of the victims were found in three homes on the same road in Peebles, said Ohio Attorney General Mike DeWine and Pike County Sheriff Charles Reader in a news conference this afternoon. The eighth victim, an adult, was found later than the other victims at a fourth location in Piketon, officials said. No arrests have been made, and authorities believe there is a high chance the individual or individuals who committed the homicides is/are still at large, armed and dangerous, DeWine said. He added that preliminary investigations showed that none of the eight deceased appeared to have committed suicide. Some of the victims appeared to have been killed in their sleep early this morning and were found shot to death in their beds, DeWine said. One victim, who appeared to be a mother, was killed lying in bed with a 4-day-old baby, he added. Three children -- the 4-day-old baby, a 6-month-old baby and a 3-year-old -- were found alive at the crime scenes, according to Reader. Authorities are still working on positively identifying each of the deceased individually and notifying next-of-kin, he added. DeWine said that while residents of the county "should not panic," they should "be careful." At a news conference Friday night, DeWine noted that authorities have interviewed more than 30 people, though he declined to characterize any of them as "persons of interest." "There are different theories that we're looking at," DeWine said, noting that investigators are still working the crime scene. Agents with the Ohio Attorney General's Bureau of Criminal Investigation (BCI) are leading the ongoing investigation at the request of Pike County Sheriff's Office, officials said. Numerous other law enforcement agencies from nearby counties are offering support. "This is a devastating time for a family," Sheriff Reader said at Friday night's news conference, also noting that the crime has shocked the rural community. "We've never had a shooting with eight victims." "We'll find who did this," Reader pledged. ABC News' Rex Sakamoto and Devin Villacis contributed to this report.